Boots for the Officers on a budget. They have lots of great reviews and for less than £15 you can't complain. See link for details. Police Discount Offers Budget Boots! If your tight for cash and looking for new Boots then check these out! They are leather uppers with a padded collar. They have steel toe caps with a protective steel midsole and double density shock absorbent sole. Inside you will find a fully moulded and removable insole. The price is less than £15 with delivery and the product has over 515 Five Star Reviews. So if you really are shopping on a budget then these Boots are for you. See the link for full prices, sizes and details. Will these Boots last the Distance? If you buy cheap you buy twice? Well is that true with these Boots? 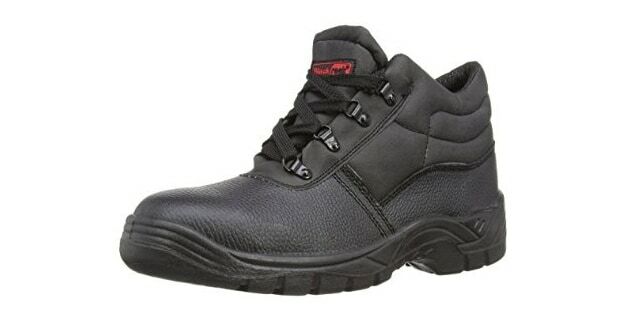 They are made from materials which conform to saftey regulations and have a steel toe cap for protection. So you would think that these Boots would be fine for Policing. The first problem with these boots is the weight, they are on the heavy side for Policing. The second issue is the lacing eyelets. If you read some of the 1 star reviews you can clearly see that they don’t last and tend to break. The bottom of the boot is designed with anti slip soles, but from feedback people have had issues with these soles as they can split only after a few months of constant daily wearing. Look at the design of the Boot and you can see they don’t support the ankle. In policing, due to the terrains and situations, we would recommend getting a Police Boot that comes up over the ankle for extra support. So will these Boots last in Policing? I think if you purchase these boots and wear them daily then within several months you may be looking for another pair. However, if you are strapped for cash and in urgent need of a pair then these Boots will do for now. Long term, I would recommend a slightly more expensive boots and one which supports the ankle.